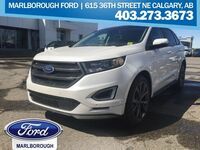 The 2017 Ford Edge in Chestermere AB brings sporty performance to the crossover class. This capable and practical crossover offers impressive engine performance, competitive fuel-economy ratings and a healthy collection of comfort, safety and technology features. All of this is paired with a stylish design that sets the Edge apart from competing vehicles in the crossover class. The stylish looks of the 2017 Ford Edge do not mean this crossover is not ready for work. The three powerful engines offered on the Edge each deliver competitive towing ratings. The Edge also offers significant interior storage space. The end result of all of these factors is a sporty and versatile crossover that is ready for any challenge. Test drive the Edge today to learn more about everything the crossover has to offer. Standard equipment on the 2017 Ford Edge includes a 2.0-liter turbocharged EcoBoost four-cylinder engine that produces 245 horsepower and 275 pound-feet of torque. Higher trim levels can be equipped with a 3.5-liter V-6 engine that delivers 280 horsepower and 250 pound-feet of torque, or a 2.7-liter V-6 that produces 315 horsepower and 350 pound-feet of torque. The 2017 Edge can be equipped with a variety of features and systems designed to maximize safety. These include: a rearview camera, rear parking sensors, inflatable rear seat belts, blind-spot monitoring system, rear cross-traffic alerts, lane departure warning, prevention system forward collision warning system with brake support, and the Ford MyKey system that allows parents to set limitations on learning drivers. When equipped with the 2.0-liter and 3.5-liter engines, the 2017 Ford Edge can tow up to 3,500 pounds. The 2.7-liter V-6 checks in at 2,000 pounds. With the rear seats up, the Edge offers 39.2 cubic feet of storage space. Folding the seats down increases the storage capacity to 73.4 cubic feet. With the seats in place, the Edge offers seating for up to five people.